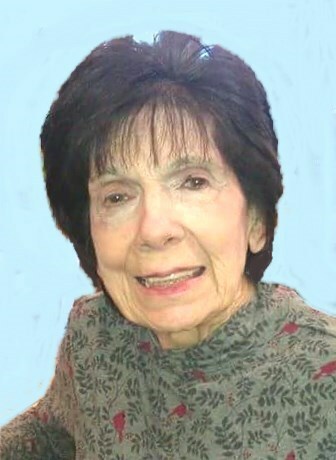 Lola L. (Vendettouli) Petrucci, 93, passed away Wednesday, August 15, 2018 at St. Antoine Residence in North Smithfield. She was the beloved wife of the late Louis V. Petrucci. Born in Cranston, she was the daughter of the late Carmine and Laura (Simonetti) Vendettouli. Mrs. Petrucci volunteered at the Franciscan Missionaries of Mary and was a member of their choir. She was a tremendous woman of faith and was exceptionally selfless. A devoted mother, grandmother and great grandmother, she is survived by her son, Louis R. Petrucci and his wife Mary Beth; her daughter, Pamela L. Scanlan and her husband Robert; three grandchildren, Peter L. Brandt, Brian E. Brandt, and Holly A. Bell, and a great-granddaughter, Abigail E. Brandt. She was the sister of the late Elmo Vendettouli, Mary Santagata and Egidia Simonetti. Visitation will be held Monday Morning, August 20, 2018 from 9 a.m. – 10:15 a.m. in the MACERONI FUNERAL HOME, 1381 Smith St., North Providence, followed by a Mass of Christian Burial at 11 a.m. in St. Mary Church, 1525 Cranston St., Cranston. Burial will be in St. Ann Cemetery, Cranston. In lieu of flowers, donations in Mrs. Petrucci’s memory may be made to: Alzheimer’Association Rhode Island Chapter, 245 Waterman St. Suite 306, Providence, RI 02906-5215.